The fourth quarter GDP report isn't due until Friday but it's likely the Fed got a sneak preview. The phrase saying the economy 'has been expanding at a moderate pace' was removed and replaced by one saying 'growth slowed late last year'. The previous statement said 'overall... [the Fed] sees risks to the outlook for both economic activity and the labor market as balanced'. That was removed in a signal that downside risks are more prominent. The strongest signal in the statement was explicit. "The Committee is closely monitoring global economic and financial developments and is assessing their implications for the labor market and inflation, and for the balance of risks to the outlook." Translation: We won't hike when markets are unsettled. The Fed removed a reference to being 'reasonably confident' inflation will rise to 2% in the medium term. To me, that's the biggest change. Before hiking, Fed members repeatedly referenced that being 'reasonably confident' about inflation was a precursor to a hike. It's a clear signal that rates won't rise in March and not until that confidence is re-established. 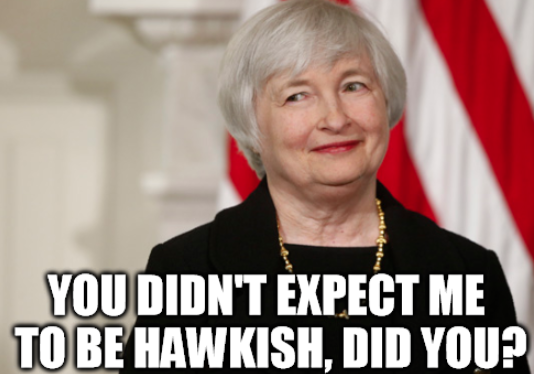 It's almost an admission that the Fed shouldn't have hiked in December. Overall, to me this is a stronger signal about rates staying low and the Fed being on the sidelines than I expected. The market isn't sure what to do with it yet, but I believe it will eventually be taken as good news. Gold and stocks should benefit. Look for EUR/USD to decline while the commodity currencies should gain against USD.